The dynamics and future urban density of the district, as well as the orientation of the site, the vastness of the sky and the proximity to the water are the prerequisites for the implementation of the project. The aim is to create a modern working environment that gives this special place a strong identity, in particular by linking architecture and landscape. The project participates in the development of this new district and dialogues with the important surrounding buildings, the shopping center and the Heaquarter of Icade which are also structured around the channel Darse. With eight levels of superstructure and three of infrastructure, the project does not exceed the limits of the plot. 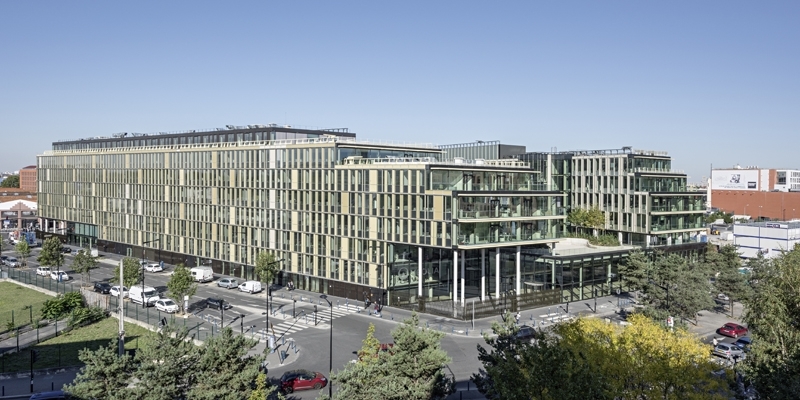 Towards Avenue Victor Hugo, the project presents a strong urban façade which participates actively in the urban development and serves at the same time as an acoustic barrier. In the East, the volume opens towards the water, revealing its interior spaces. The withdrawals in the higher levels correspond on the one hand to urban regulation, but also to the desire of bringing more sun and natural light into the building.